If you've always wanted a drill chuck that could hold larger bits and let you switch from size-to-size quickly without fiddling with a chuck key, this mammoth, three-and-a-half-pound beast is your answer ! Manufactured especially to Shopsmith's stringent specifications, this rugged, smooth-acting chuck cuts bit-changing times significantly -- feels like quality in your hand -- and delivers the kinds of performance you would expect from any Shopsmith product. It's a real “beauty”. Measuring 6" from end-to-end, it's over 2-5/16" in diameter with a 1-1/4" wide, deeply knurled band that gives you an easy, slip-free grip. Its three precision-ground jaws open and close with amazing smoothness to grasp bits from just 1/32" to 5/8" in diameter. 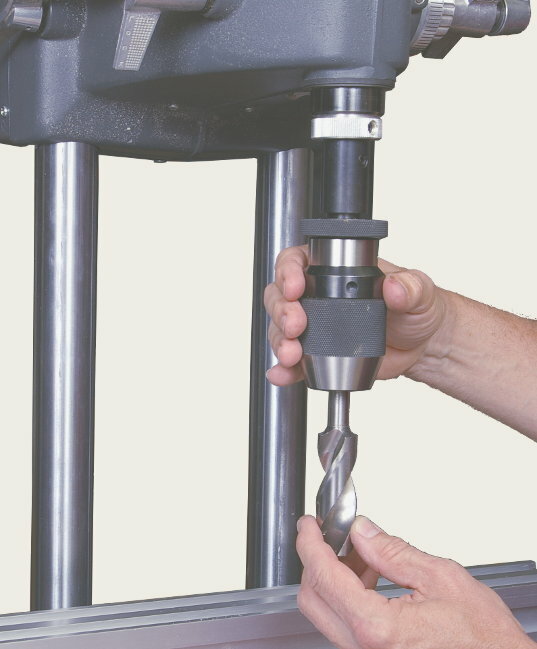 It also works well for turning dowels up to 5/8" in diameter... and for smoothing or cleaning steel or aluminum rods, tubing and similar items. You will NOT be disappointed !